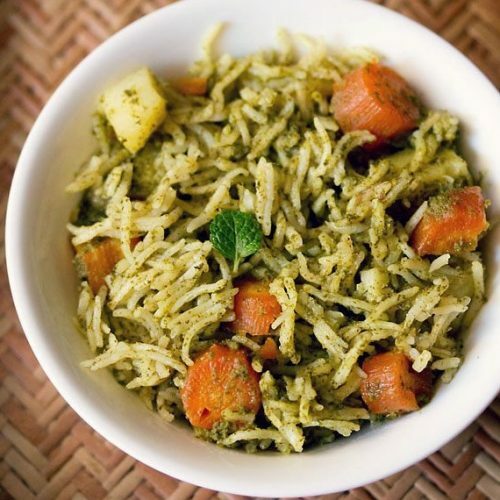 one pot recipe of a spicy chutney pulao with mixed veggies. rinse 1 cup of heaped basmati rice in water very well. then soak the rice in enough water for 30 minutes. after 30 minutes strain the rice of all the water and keep aside. meanwhile, when the rice is soaking, you can chop the veggies. also prepare the green chutney. take all the ingredients mentioned under the list 'for green chutney' in a grinder jar. grind everything to a smooth and fine chutney. keep aside. heat 2 tbsp oil in a pressure cooker. add all the whole spices mentioned under the list 'whole spices'. saute the spices for a few seconds till they become fragrant. add ⅓ cup thinly sliced onions. saute the onions on a low to medium flame, stirring at intervals, till they turn golden. now add the green chutney. stir and saute for a minute. add the chopped veggies and turmeric powder. mix the veggies very well with the chutney. add the rice. gently stir and mix the rice with the rest of the ingredients. add 1.75 cups water, 1 tsp lemon juice. season with salt. stir well. cover and pressure cook chutney pulao for 1 to 2 whistles or for 7 to 8 minutes on a medium to high flame. when the pressure settles down on its own in the cooker, remove the lid. gently fluff the pulao. serve chutney pulao hot with a side dish of raita, curd or a veggie salad. you can also garnish with some chopped mint or coriander leaves while serving. add 2 cups water. cover tightly with a lid. cook on a low flame till all the water is absorbed by the rice.